For moms dragging their kids through clothing aisles. For moms racing to keep up with school fashion. For you, FabKids was created. Monthly outfits and shoes with a click. You kids will always look great. And you get the value you so richly deserve. 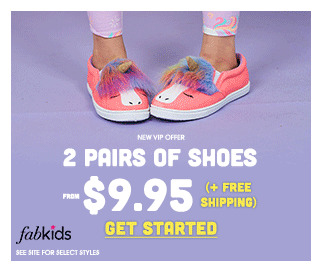 For a limited time, they are offering 2 pair of shoes from $9.95 with free shipping. Follow the link to take their free style quiz and gain exclusive access today.